Summer in India is also known as Masala Season. I prepare all the Masalas, used in making delicious dishes, at home. Today I am sharing the recipe of Dhana Jeera Masala, also known as Coriander and Cumin Powder. It gives a rich flavor to any Indian Dish. 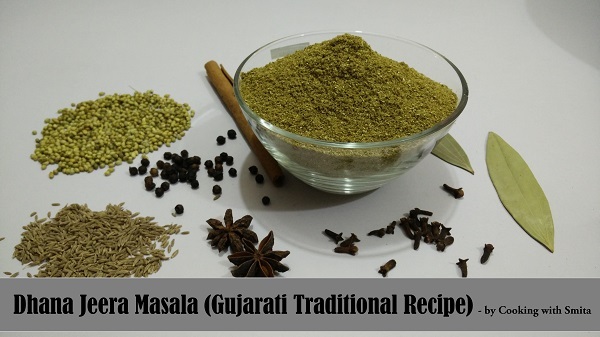 Unlike widely used 2:1 ratio of Dhana and Jeera, in this Gujarati Traditional Recipe, 5 other spices are used to make this Dhania Jeera Masala. Learn how to make this Masala at home and store for a year or even more without adding any preservatives. You can also roast each spice for 1 & ½ minute over the low flame. Add all ingredients in a mixer jar and grind to a fine powder. Sieve using a fine mesh strainer and grind again leftovers. Repeat the process and grind remaining spices. Dhana Jeera Masala is ready.